Castle Rising is fortunate, being one of the few parishes in Norfolk which has access to local building stone (Silver Carr and Small Carr) as well as having clay suitable for brick making. The Romans appreciated the quality of the unique Silver Carr concretions here and shipped it along the coast to build their fort at Brancaster. The Normans also used it extensively when building the castle and the village church, although the finer limestone was imported from Barnack and Caen. 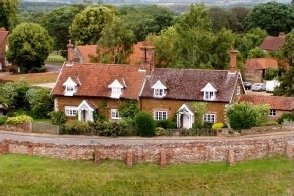 The most characteristic building stone seen in the village houses is the gingery ironstone called Small Carr which was quarried near Roydon Common. It has been used in several different ways as large blocks, both coursed and uncoursed, often with garretting set into the mortar or small tablets usually with the mortar recessed. Most of the eighteenth and nineteenth century cottages in the village were small and modest, built for estate workers or agricultural labourers by the land owners. Viewed from the front they show neat brick or carrstone walls and attractive brick chimneys but from other viewpoints can be seen as a whole history of repairs, alterations and additions done using and re-using whatever material was available – field stones of flint, carrstone, Silver Carr and chalk, broken and misfired bricks and stones and bricks taken from the ruined castle buildings. The estate maintained their buildings but was not usually prepared to spend more than was strictly necessary to do so. dormer windows and wooden porches. 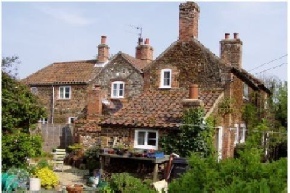 In the early twentieth century many of the buildings of Castle Rising including some of the cottages, farmhouses, barns and other redundant farm buildings were in a very poor state but by the 1960s and 1970s when rural living had become more desirable, mobility easier and grants to improve housing available, some of these were sold, restored, updated and often combined to make very comfortable homes. New houses were also built and some of the redundant farm buildings were restored for other uses both residential and commercial.